To achieve your ultimate goal in life you must first be able to visualize and identify what exactly it is you desire. What would really make you a happy or content person? Do you desire financial prosperity, a closer relationship with someone you love, better health and tranquility or spiritual enlightenment? To understand and use the power from within, one must first list in detail those visions and goals that would manifest his or her ultimate fulfillment. Obvious as it seems, your initial step should be to make a written list of these visions and goals. Secondly, you must identify any obstacle that may stand in the way of you achieving the utmost in a rewarding and joyous life. Making a written list, again, of any barriers or opposition that might realistically limit you from reaching that financial attainment, spiritual enlightenment, or self-development goal, will elucidate the path to the choices for your future. Your obstacle may be a lack of knowledge, goal, a dead-end job, or perhaps motivation and the spirit to succeed. Let us now set out a new course of action that will make a permanent change in our mind set and habits, freeing us to achieve ultimate fulfillment. Having identified a set of definite goals and the precise obstacles which have prevented us from achieving them, we can redirect our lives by learning how to use the unlimited resources of our subconscious mind. The conscious and subconscious mind have often been compared to a computer or bio-computer. To better understand the process of overcoming our pre-programmed obstacles, let us examine the function of this powerful bio-computer. First of all, approximately 12% of the brain is employed in the functions of the conscious mind, operating at the higher Beta brain wave frequencies. The conscious mind acts as a communication center, directing all deliberate operations of the body as it calculates, it registers fear, pain and happiness. It is the conscious mind that is constantly setting and achieving goals on a daily and even hourly basis. The subconscious mind is involved with the functioning of approximately 88% of the brain. Operation in the slower Alpha, Theta and Delta brain waves, the subconscious acts as our auto pilot, the data storage-retrieval system, our memory bank. It controls our motor functions and emotions and stores a lifetime of experiences in the form of ideas, images, visions, feelings and general knowledge. It is the sum of all our influences, experiences, whether good or otherwise, which add up to what we are, how we see ourselves and how we functions. Unfortunately for most of us, the majority of information stored in our subconscious mind is negative. Researchers estimate that the average child in America receives twenty negative messages from his or her parents for each positive, reassuring one. Some people just cannot meet their goals because they have no information in their subconscious giving an indication that these goals are possible. Our subconscious holds our visions, or mental pictures of us in every situation we can think of and it will do whatever necessary to keep us in line with these pictures, or visions. Thus it is possible to change our behavior by changing these underlying mental pictures. While you cannot delete information from the subconscious, you can overpower the negative by reprogramming with positive information. By this process an old mental picture is replaced by a new positive one and we behave accordingly, overcoming our past obstacles. A very effective method of replacing our mental pictures with new ones is by means of subliminal reprogramming. 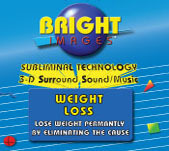 Subliminal, subconscious level, audio self improvement tapes, CD's and mp3 programs at www.brightimages.com have proven to be incredible powerful tools for removing self-imposed limitations that keep us from reaching our potential in any area of life that calls for attitude, confidence and performance and they can bring us in touch with our enlightened self. Much progress of recent years, both in our understanding of how our subconscious recording computer operates and the utilization of advanced digital recording technology to match our bio-computer equipment, makes us realize the awesome power of our highly complex bio-computer. 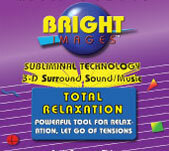 Bright Images Subliminal Audio Tapes, CDs and mp3 Programs are considered to be the most advanced bio-computer software programs available today. There are several reasons why these programs are having such an impact on their listeners. 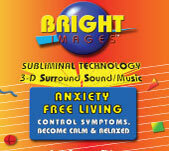 To begin with, Bright Images are a direct result of the over 10 years of research and development undertaken by the prestigious Midwest Research, a world leader in subliminal education and technology. They have produced numerous custom programs for sports and health professionals, university controlled studies, corporate business and medical practitioners. Custom programs like the theft prevention systems used in our large department stores and programs like the pain block tape, which are prescribed by doctors for their patients. 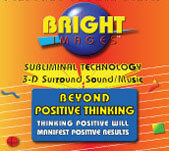 The Bright Images is the result proven success and continued improvements using advanced technology for a professional educational subliminal experience at the highest level possible. 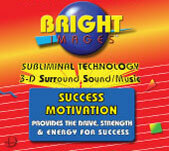 Each Bright Images Program script has been created specifically to generate mental pictures to be stored in your mind, visions and motivation. Visions in your mind to promote your positive self-image, attitude and confidence, enabling each person to manifest a new vision for an ideal life. These scripts follow sound theoretical constructs based on known psychological order of information, developed with the aid of leading experts in each appropriate filed to provide the knowledge necessary for successful change. Next, the scripts go through a review process of edits, suggestions, revisions or approval by an independent advisory board, headed by Professor Philip Hansen, Ed. D., California State University, the STI. This credibility assures that each program developed for use is 100% positive, safe and effective when used as prescribed. Experts tell us that subliminal messages cannot be turned to harmful uses, especially behavior modification, without a subject's conscious consent, (this is thought to be the reason the CIA stopped their research years ago in this area). Researchers have shown that the human mind can process 100 million bits of information every second, through our five senses. 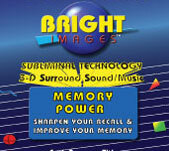 Several new and powerful techniques where developed to make the Bright Images audio programs the most effective tools available. A new 3-D Sound recording process, SARA, utilizing 27 strategically placed microphones to produce anatomically correct recording, just like we hear sounds live. 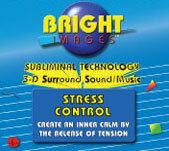 All three audio tracks found in Bright Images programs utilize this advanced virtual reality, 3-D recording process. The affirmations become emotionalized, taken in readily by our subconscious recording bio-computer. The environmental sound tracks are recorded live with this special 3-D enhancing recording technology, using numerous exotic birds, streams, waterfalls, water caves and ocean waves, making you feel like you were there. Also, the original new adult contemporary music sound tracks developed for Bright Images programs become very entertaining and enjoyable to listen to, which is very important for repeated use. The end result of these advanced techniques provides highly concentrated amounts of positive data, 20,000 statements per hour, directly to the subconscious mind, data storage bank. This new positive information is received more readily to effectively overpower any previous negative messages in that "file", (they are out numbered), giving way to positive behavioral changes. It is very important to use a high quality program, one that has been proven to be effective in a relatively short period of time, so you will have more time to enjoy your new zest and vigor in attaining your goals. Now, take control over your personal future using the most advanced self-help tools available, using SYNERGISTIC, Proven Technologies. Unlock the knowledge and unlimited power of your subconscious! Learn to merge your subconscious with your conscious mind, turning your bio-computer into a receptive state of positive awareness. After only a short while, you will appreciate a tremendous increase in your ability to sort, compare, digest, combine and consciously retrieve vastly more information that the biggest super computers. Setting a new course for your life can begin with an amazingly simple step. 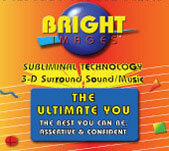 Choose among the 37 Bright Image Programs available and access your bio-computer with a deluge of positive, directed information. As your conscious mind seeks stored data to satisfy your visions and goals, it will now be able to pull up 100% positive data designed to enhance your life and advance you toward that same vision and goal. You will begin to manifest your vision with new pictures in your mind from repeated exposure to these powerful audio programs. Pictures of prosperity, success and of a sound, healthy mind and body. 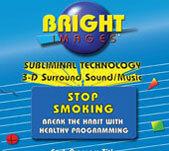 Article written by Jerry Wood of Bright Images Subliminal Self Improvement. 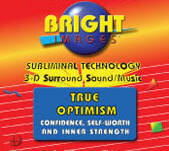 For the Best Tips, Tools & Resources to help you Manifest Your Self Improvement Goals, visit http://www.brightimages.com for Subliminal Education and our complete Self Help Centers.